Master's Velvet Tams are available in your choice of four, six, or eight corners. 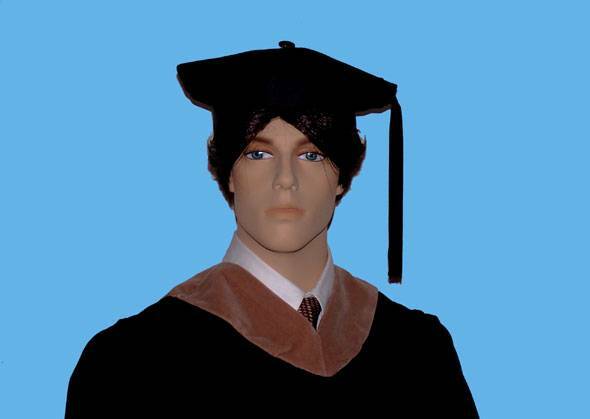 Although historically, most Master's degree graduates wore a standard mortarboard with their gown, many Master's degree holders who are also faculty members are now opting to wear a velvet tam rather than a mortarboard differentiate themselves from their students. As such, we now offer a Master's level faculty tam, similar to the doctoral tam, but with a plain black tassel in place of the gold doctoral tassel. Like the doctor's tam, the faculty Master's Tam is available in four - six - or eight sides. However if you do not wish to purchase the Master's tam, we would be happy to send you a mortarboard & tassel, at no charge, with your gown. Whether you pick a 4, 6, or 8 corner tam has less to do with regulation and more to do with looking your best! Generally, most people seem to prefer the six sided tam, however extremely tall and skinny people may do better with the 8 corner tam since it tends to look more round, and help "fill a person out", while short stocky people may do better with a 4 corner model, since it is sharper and thus makes the person look "less round".